On fri 18th september the big golden midas touched wall of bristol's colston hall opens. I'm not sure if there is anything of much interest on the other side. I think its just a foyer. a really really big over priced one. but nevertheless bristol is having a treat which I'm pretty excited about. Lots of little pianos will be dotted about the city centre for the public to enjoy. I just can't believe we haven't thought of this before... lets keep them and have a tinkle. 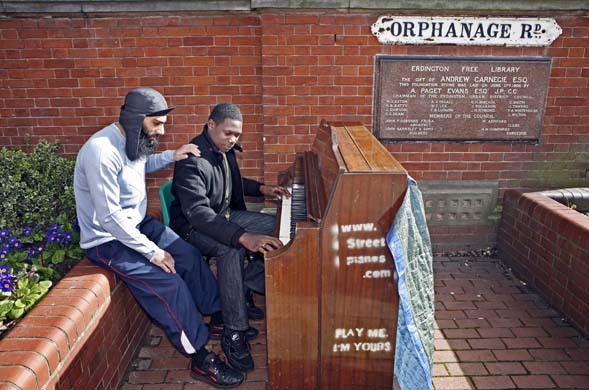 apparently they put a piano in st.george and one in bedminster in bristol. these are the only two pianos of the entire history of this project that have been burnt down. the bristol youth- making it their own.